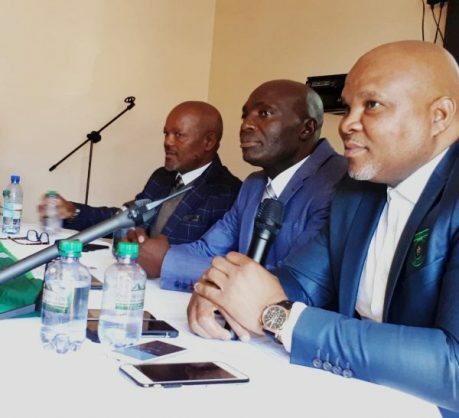 Baroka FC chairman Khurishi Mphahlele (L) with coach Wedson Nyirenda (C) and club CEO Morgan Mammila during a press conference. Baroka FC coach Wedson Nyirenda hopes the four Bakgaga players called up for their respective national teams will use the international experience to help the Limpopo outfit. Botswana duo of Mpho Kgaswane and Onkabetse Makgantai, Zimbabwean winger Talent Chawapiwa and Tanzanian defender Abdi Banda will be in action this weekend. “Yah it brings an important dimension of the game because this is not Chan or Cosafa, it’s Afcon. So if they play in those matches they will be playing at a different level. We also expect them to come back and do something tangible to the team. If they come back and they relax again then it’s very unfortunate because an international player should be seen to be different on the pitch,” Nyirenda was quoted as saying by LimSportsZone. Baroka have been inconsistent so far this season.